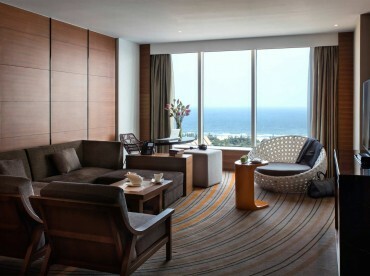 A high-floor room with views stretching over Back Beach or Vung Tau. Smart layout in 40 sq m (431 sq ft) of space. Modern design combines performance and pleasure. Upscale amenities and furnishings make the Pullman Executive room a place to work for business and play for leisure. Free high-speed Wi-Fi makes staying connected effortless. Room service and the Fit Lounge are open 24/7, so adventurers can revitalise around the clock. The Executive room comes with Executive Lounge’s privileges including private welcome area with stunning sea views, breakfast, all day refreshments, evening cocktails and canapés.